Quinn's summer is not going so well—her grandmother is diagnosed with Alzheimer's, her dad's gambling addiction is only getting worse, and the boy who ruined her life, Wesley James, is back in town. When Wesley is hired on at the same restaurant as her and joins the school band, it becomes more and more difficult for Quinn to exact the revenge she seeks as she sees Wesley's true personality and begins to fall for him. Between trying to get Wesley fired and stifle her feelings for him, she also struggles with longing to go on the school's London trip and not being able to afford it. Thankfully, Quinn learns the truth about the reason behind her parent's divorce and overcomes her pride so as to forgive Wesley and let him into her heart. She also gets the money to go to London and enjoy the place where her grandparents met and fell in love. This book is a cringey attempt at a teen romance. First off, Quinn's personality is difficult to like—she blames eleven-year-old Wesley for letting slip that her dad lost his job, and therefore blames all the misfortunes of her entire life on him, which is not only unreasonable but also just dumb and very immature. 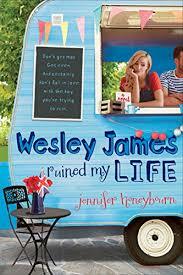 The author adds in unnecessary points of drama (Wesley has a girlfriend, Quinn leads on another boy, someone accuses Wesley of stealing money, etc.) and has side characters fulfill one job only, often changing their personalities so as to fit the role she needs them to in order to further the drama. There were a few sweet moments between Quinn and her father and Quinn and her grandmother, but mostly this book was full of bland tropes and eyeroll-inducing melodrama. Some young readers might appreciate this book for its romantic plot, but most readers should pass over this one in favor of a more substantial romance.